Meizu M3s comes with a 13mp rear camera and 5mp secondary camera. It has a battery of 3020mAh. It has also been included with a fingerprint sensor. It gives quite a lot in a very less price. It runs on the Android OS v5.1 (Lollipop). All the Android phones in the market are generally running on at least Android 6.0(Marshmallow). This a budget smartphone with high end features of that of a flagship phone. It costs 7999 INR and is available for sale in the Indian market on sites like Snapdeal and Amazon. You get to choose from two colours of Grey and Gold. Overall it is a good purchase as a budget phone. This model is released in the colours Silver, Grey, Pink, and Gold. The fingerprint sensor is added in the front exactly in between the lower bezel. There are two thin white strips on the back marking the bottom of the upper bezel and the top of the lower bezel. The LED flash follows the camera under the upper white strip. The M3s comes in a comfortable size of 5.59x2.72x0.33 inches (141.9 x 69.9 x 8.3 mm) and weighs 138 gms. The phone is light when compared to the other smartphones available in the market. This comes with a 5.0 inches display with a resolution of 720x1280 pixels. It has a capacitive touchscreen with a display type of IPS LCD. The screen to body ratio percentage stands at 69.5%. It also homes a Flyme 5.1 to give a smooth multi touch experience. The pixel density that the phone comes along with is of 292 PPI. Overall, Meizu has included a good display for this low budget phone. Meizu has managed to add a high end rear camera of 13mp and a secondary camera of 5mp. There is also a video recording feature of [email protected] Primary camera works with phase auto detection focus amongst many other features such as touch focus, face detection etc. Meizu M3s comes with an internal memory of 16GB and gives an option to the users to expand the storage capacity till 256GB. User can do the same by adding a micro SD card to the secondary SIM slot. Meizu M3s houses a 3020mAh non-removable battery. This is a long lasting battery and can last up to a day. M3s runs on Octa-core 1.5 GHz Cortex-A53 and has a chipset of Mediatek MT6750. It suns on the Lollipop version of Android and has GPU of Mali-T860MP2. It supports 4G and comes with sensors such as the accelerometer, gyro, proximity and compass. It has a USB slot that supports MicroUSB2.0.The various other features that are added are SMS(threaded view), MMS, Email, Push Mail and IM. It is of course a very good budget phone. There will be a few lapses here and there but Meizu has tried to encompass as many features as possible into this phone. You can have a glance of the specs here. 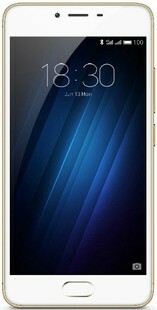 Meizu M3s full specs and reviews as of Apr 2019. Buy it here!